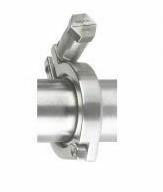 Over-tightening causes hygienic seal intrusion into the piping I.D., which can result in tearing, sticking and, ultimately, system contamination. Rubber Fab’s Controlled Compression products act as a positive mechanical stop making “over-tightening” virtually impossible. Torque-Rite® allows you to control compression and expansion while maintaining constant inch/pounds force ensuring a perfect surface I.D. when used with a Rubber Fab sanitary gasket! A system begins to fail when a gasket begins to leak. The traditional answer is to tighten the clamp to eliminate the leak. You believe you are fixing the problem, but in reality, you are creating a greater problem.